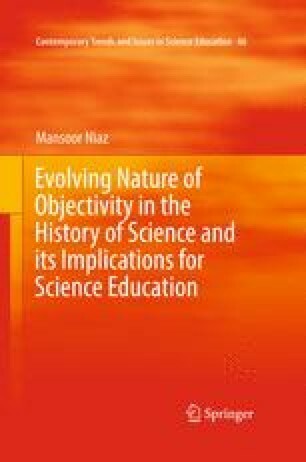 In this chapter, I first explore the relationship between transgression and objectivity and then study the importance of Scanning tunneling microscope (STM) and Atomic force microscope (AFM) for chemical research (nanotechnology) and how these are presented in general chemistry textbooks. In order to understand scientific progress, Roald Hoffmann (2012), Nobel Laureate in chemistry, invokes the idea of “transgression of categorization” and Daston and Galison (2007) refer to it as violating the rules dictated by objectivity. When consulted, Hoffmann confirmed that the two concepts approximate to each other. Furthermore, both understand the transgression of objectivity in the context of Hacking’s (1983) differentiation between “representation” and “intervention.” Nanotechnology is not concerned about errors in our knowledge, nor if we are dealing with real objects but rather with creating and manipulating to construct a new world of atom-sized objects. In this context, it is plausible to suggest that at present progress in science is at a crossroads. Based on this perspective, 60 general chemistry textbooks (published in USA) were evaluated on the following criteria: (1) Objectivity; (2) Scientific method; (3) STM; (4) AFM; and (5) From representation to presentation: scientific progress at a crossroads. Textbooks were classified as satisfactory, mention or no mention. Percentages of textbooks that were considered to have a satisfactory presentation on the five criteria respectively were the following: 8, 18, 27, 12, and 25. This shows that understanding objectivity was the most difficult for textbooks.